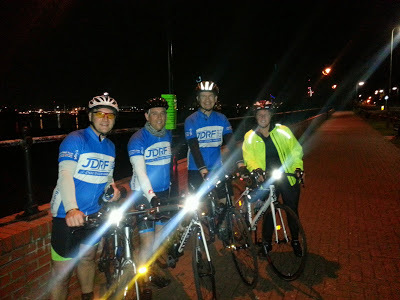 Three days from now, at dawn on Sunday, I should have just finished cycling 100km around London, raising money for JDRF. I truly can’t wait to do it particularly as I’m doing it as part of a team mainly consisting of my work colleagues. We start off from Crystal Palace at 10:35pm anti-clockwise through Tower Bridge, Canary Wharf, Olympic Park, Alexandra Palace, Waterloo, Whitehall and The Mall before ending up back at Crystal Palace. Last year I read about Nightrider shortly after cycling next to Gav in his GBR30/30 challenge and it captured my imagination, so I decided to do it in 2014, probably by myself. Discussing it at work and Jon decided he’d do it as well, perhaps we could ask a couple of others he suggested. A few chats later and the team grew to 5 from work and Steve who lives close by. A month later and we’re up 8 cycling for JDRF and 3 cycling for CancerResearchUK. 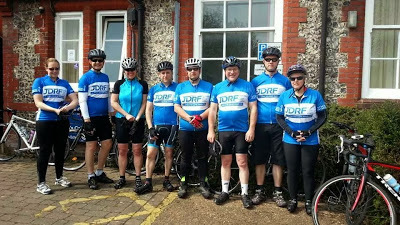 In total there’s 21 JDRF riders starting from Crystal Palace including my team plus Nick, Mark H, Andrew whom I know from either Twitter or the Cycling at JDRF Facebook group. There’s also a lot of JDRF riders starting from Alexandra Palace about an hour later. 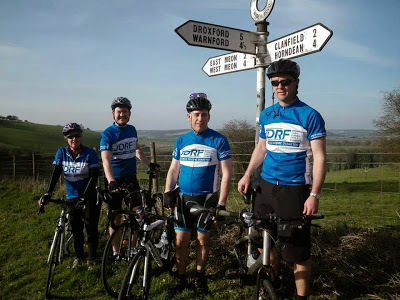 We’re riding for JDRF and they’ve set a target for each person of £175 per person, on top of the £39 registration we’ve each paid. For this £175 JDRF have bought a charity place from Nightrider for £60 and on top give each cyclist a JDRF cycling jersey, which in itself must be worth £35. So in theory JDRF don’t get much money in from this event, just £80 per person if they reach their target. A few days ago I was concerned we wouldn’t reach out target, it sat £400 short of our combined target of £1400. In the last few days though sponsorship has come flooding in and we’re close to £2000 already. Sponsorship page is here if you want to see how we’re doing…or donate.. bit.ly/nightridertf. For some cycling 100km is easy but there’s only one of our team – Steve – who could boast this, with Shaun coming a close second, for the rest us it was going to take a fair bit of training. So off we set on our first training ride back in January, a mere 30km but a distance which seemed daunting at first. Training rides got longer week by week, some hills got thrown in and the weather started improving. A few other friends/colleagues started joining in the rides and a few of us managed to get out each weekend. 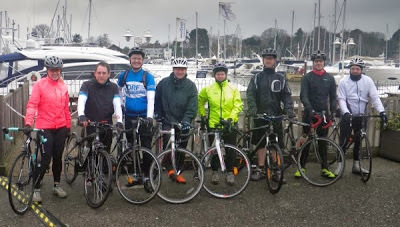 We set a target for 60km on April 21st when many of us entered a local Sportive. Five of my team did it along with two other Nightriders, Nick (coming down from Derby) and Mark (coming from London), plus a friend Gemma. That turned out to be a great ride through lovely country roads and finishing with a nice BBQ afterwards. Tagged cycling, events, JDRF, Nightrider. Bookmark the permalink.